Glenwood Springs Hot Springs, discovered by the ancient Ute Indians, has for thousands of years been the source of legends, both for healing and relaxation, with its mineral-rich waters. Glenwood Hot Springs in Glenwood Springs, Colorado, gives the visitor a relaxing way to unwind from days of adventures in the Rocky Mountains. Kept at a comfortable temperature (90 to 93 degrees), the pool creates a difference from the moment you step in. Soak away your ailments and the rush and bustle of the workaday world. There are many other activities to enjoy here, too, such as miniature golf, water slides and much more. 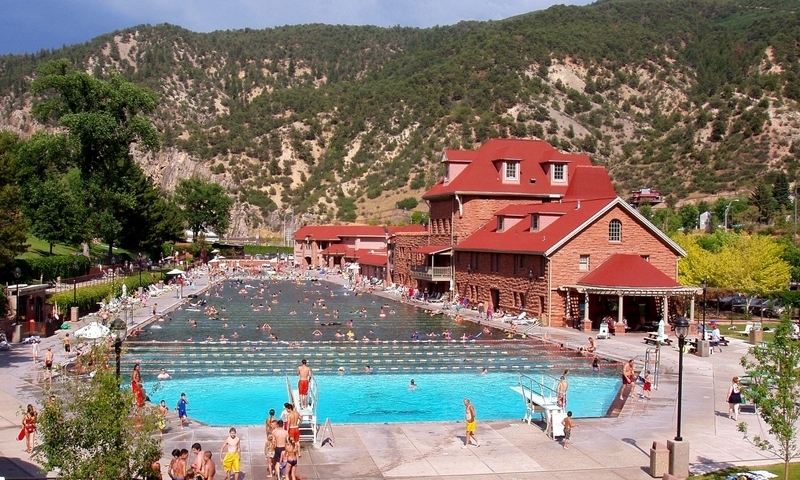 Glenwood Springs Pool is located off of I-70 at the Glenwood Springs exit (#116). Once you exit, go towards the traffic light, but you’ll make a right onto North River Street just before the intersection. From there you will see the sign for the Hot Springs and can park on the left. From Aspen, take Highway 82 north for about 40 miles, driving over the Colorado River and taking a right on 6th Street. The lodge is 1 ½ blocks further on, on the left. Glenwood Hot Springs Pool is open all year every day of the week, except some days they are closed for maintenance. You can call to check before your arrival. The Kiddie Pool is open every day during peak season from 10:00 am to 5:00 pm. Glenwood Hot Springs, Colorado rates apply only to those who are not staying at the Lodge. Admission price is good for a full day, and you can come and go with a hand stamp. The Ute Indians called these hot springs Yampah Hot Springs and they were considered a sacred place for healing. They were discovered in 1860 by white explorers. Later, in 1880, it was planned to make them into the largest hot spring pool in the world.